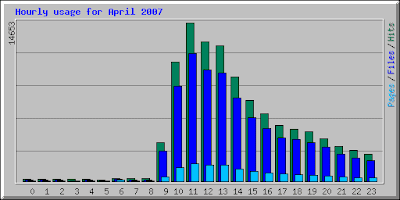 Before 9:00 Monday morning, less than 10 people had ever heard of Twiddla.com. 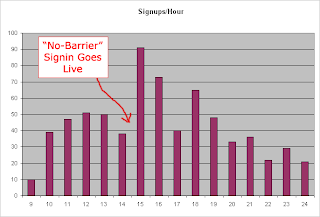 By 11:00 that night we had 1000 registered users. I guess it's all my fault. After all, I did write a little article about it over at the Expat Software blog. But I only mentioned the URL once, way down at the bottom. Who would have thought anybody would read the whole thing? Actually, most of the credit will have to go to Reddit. The story went up there in the morning and quickly found its way onto page one. Before long, a steady stream of early-adopter type techno-folk were reading the article and following it to the site. They evidently told people about it and next thing you know we had a ton of new users turning up at Twiddla.com. 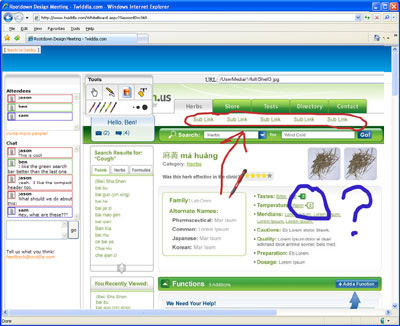 Massive-scale usability testing is quite a thing to behold. As it turns out, Twiddla is a pretty good platform for getting user feedback about the Twiddla experience. Early Monday morning, we opened up a couple "Show and Tell" sessions and invited people to hop in. People would stumble into these sessions at the rate of about one per minute, and immediately start asking the same questions: "Why is the pen so fat?" "Why does it cut the corners out of my circles?" "Whoa! Did you see that??? My line just turned orange halfway through drawing it!" We couldn't have gotten better feedback had we gone to these people's houses and stood next to them. Around 2:00, somebody came into the Show and Tell and said that we shouldn't be making people register just to try the thing out. Yeah, we'd meant to have a simple "Let Me In as a Guest" button, but hadn't spent the time to build it. This guy had some pretty good points, so I stepped out for about 15 minutes and built the "Lemme In!" button. I pushed the build live and Things. Went. NUTS. Suddenly we started getting new users showing up every 5 seconds. Of the next 300 people to sign in, only 4 of them bothered to create a username and password. Wow, talk about feedback. Break down that one last barrier to entry and everybody will give your thing a shot. It's too bad that we didn’t open this up sooner, since we had passed our initial user spike and things were actually slowing down when I pushed the "Lemme In" button live. 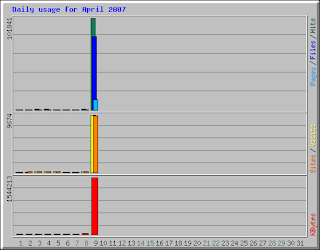 Check out the graphs. I wonder how many people we lost during that peak period because we were asking them to sign up for our service just to try it out. Good lesson learned. We hadn't spent any time polishing the application before going live. Granted, we didn't realize we were going live, but that's not really an excuse. People picked up on little things and sometimes decided not to dig any deeper. While the feedback we got was overwhelmingly positive, the emails we got saying "Love the Thing!" always ended with "Wish the pen wasn't so big". It would have been nice to get some more feedback along the lines of "What are you going to do about viewing sites that require a login?" I bet that if Twiddla looked a bit more professional out of the box, people might have found some more significant things to comment on. Twiddla has gone through a lot of changes this week. Just about every issue that came up that first day has been addressed, and several new features have gone in. The user interface is a little smoother, and the application is a lot more stable overall. Talking to users that first day gave us tons of new ideas for what to do with the site. Next up will be the ability to view sites that require logins and cookies, submit forms, and basically do a bunch more stuff that it doesn't seem like you should be able to do in a browser. It's about to get good! Thanks again to the thousand souls that showed up that first day and told us what they thought of the site. We found plenty of things that need improvement, but mostly we got a ton of encouragement from everybody. People seem to like the idea, and it sounds like we're on the right track. I look forward to hearing more of your feedback as we build Twiddla into a usable application. Keep us steered in the right direction and we can't help but get this thing launched!